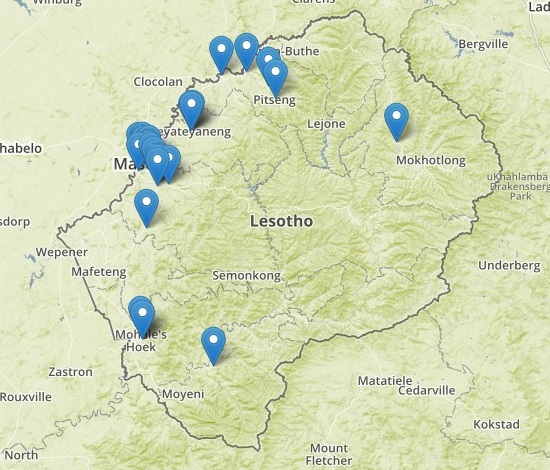 #MapLesotho has been working on a basemap, without any real priority for tagging buildings, yet the local Basotho OSM community has tagged quite a few interesting things. Would “Petrol Station” prove to be one of those? And so Colin Broderick went into the OSM database to fish out such tagged buildings and their co-ordinates and published the data using MapBox here. What came back seems to be lacking the Petrol Stations in the east and central regions of the kingdom, Thaba Tseka and Qacha’s Nek where least building tracing has taken place. There are also some Petrol Stations in the western towns not shown. One of the advantages of OpenStreetMap is to allow application developers like BuggyIdle to innovate and turn all the spatial data into a useful mobile phone application. I know from first hand knowledge that petrol stations outside the main towns are few and far between. Most vehicles travelling in the mountain roads of Lesotho have at least one spare petrol can. A mobile app akin to pumps.ie would be used by NGOs and locals alike and show, once again, that OpenStreetMap data can make a real difference to logistics, travel and the lives of people in Lesotho. Knowing the price of the fuel and the availability of services at the fuel stops, distance to them and the nearest one are also typically handy features. The blog will be updated with the details of “pumps.ls” when it becomes available. All inquiries to BuggyIdle as he plans to have in on android platform and available on the Play Store.